It may seem like midsummer is a slow gardening season, but there are plenty of tasks gardeners can attend to in July to ensure a productive, healthy harvest and beautiful flowerbeds even during the hottest summer days. Spring rains have ended and summer heat is picking up in July, stressing plants and making adequate water a priority. Gardens should be watered either early or late in the day when less water will be lost to evaporation, and drip systems are the best options to minimize water loss. Any trees that have been recently planted or are less than three years old should still have dedicated watering throughout July to ensure they do not dry out and the roots can continue to establish. Use a dribbling hose to soak around trees for an hour to water them sufficiently. All containers, including hanging flower baskets, need more water during hot July days. Smaller baskets may need to be watered twice, particularly on windy days that can dry plants out more quickly. Weeding is a never-ending garden task, and even during hot July days it is essential to remove unwanted plants that compete for water and soil nutrients. Weeds will be easier to pull when the soil is damp, so it can be better to weed immediately after watering the garden. As different flowers, vines and plants grow taller in July, it is important to stake and support them appropriately so they do not fall or break. When staking plants, however, keep ties loose so the plants are not choked as they continue to grow. Turning and aerating compost in July will help speed the decomposition process and minimize unpleasant odors, and if necessary, the pile should be moistened carefully to provide beneficial bacteria with suitable moisture, but it should not be dripping wet. 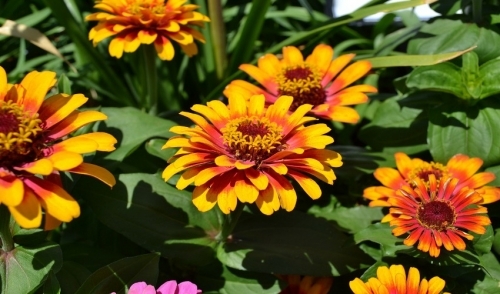 Both annual and perennial flowers can be deadheaded in July. For late spring flowers, this may encourage one last blooming, while perennial flowers will continue to bloom profusely for several weeks if they are properly tended. July is the perfect time to propagate shrubs, herbs and spring perennials to spread plants to other parts of the garden or to share with friends and neighbors. Choose only the healthiest plants for propagation, however, and care for them well to encourage luxurious growth. July is a good time to carefully prune trees to eliminate damaged branches that could be dangerous during thunderstorms, or to help trees keep their desired heights and shapes. Pruning will also permit better light and air circulation for fruit trees or shade gardens. While most planting is complete by July, planting late autumn produce can extend the growing season and provide a more bountiful harvest. Collards, lettuce, cabbage, beets, broccoli, radishes, turnips, zinnias and pansies can all be planted in July. By July, some fruits and vegetables are read to harvest and it is time to start canning or preserving produce to maximize the garden's productivity. Onions, garlic and peaches can all be harvested in July, and young cucumbers can be made into delicious pickles. By midsummer it is possible to see what is and what isn't working in the garden. Keep a detailed notebook of plans, ideas and tips for next year, and start considering what changes to make to keep the garden at its best. It may not seem like it, but July can be a busy gardening season, and a busy gardener is a productive gardener who will have a healthier, bigger, more diverse harvest to enjoy. © 2019 Agriventures Agway. All rights reserved.